Machynlleth TownThe historic town of Machynlleth sits at the mouth of the Dyfi estuary in the heart of the UNESCO Dyfi Bioshere, an area of outstanding natural beauty and diversity. In order to celebrate and protect this unique environment it has recently been made one of only two UNESCO Biosphere Reserve sites in the UK. The Centre for Alternative Technology has been hugely proactive in promoting ecological technology and lobbying for environmental policy both in the UK and internationally. The centre itself is extremely popular amongst visitors both as an inspiring educational resource and as a fun day out. As well as the Centre for Alternative Technology there are a host of other attractions on offer in Machynlleth including King Arthur's Labyrinth, Corris Mine Explorers. The Museum of Modern Art Wales houses a superb permanent collection and its Tabernacle buildings provide a venue for numerous festivals, including the Machynlleth Comedy Festival. The weekly Wednesday market and biannual fair are still hugely popular despite dating back to a Royal Charter issued in 1291, The e town is full of independent shops offering local crafts, galleries, and plenty of cosy cafes to stop for a paned (cuppa). The town has enjoyed a distinguished history. Its claims to being the ancient capital of Wales are based upon Owain Glyndwr's short lived government of 1404, which was housed in the Parliament buildings that are still open to the public today. There is evidence of human settlement in the Machynlleth area dating as far back as the Early Bronze Age (c. 2750 years ago) with evidence of copper mining activity within a mile of the town centre. It may be that the legend of 'Cantre'r Gwaelod', the magnificent city and fertile plains now lost beneath the waves near Aberdyfi speaks of this period, or of settlers further back in the mists of time - possibly as far back as the end of the ice age when significant sea-level rises re-shaped the coast of Britain. The Romans built a small fort at Pennal, some four miles west of Machynlleth, and archaeological evidence suggests there was modest Roman settlement in the area around this fort. One of the earliest written references to Machynlleth is the Royal Charter of 1291, granted by Edward I to Owen de la Pole the Lord of Powys. This Charter allowed Machynlleth to hold a market every Wednesday and two fairs a year, a tradition that continues to this day. It is clear that the market and fairs helped Machynlleth to thrive throughout the Medieval period and right through to the Victorian era with evidence to suggest that animals came for sale from across the length and breadth of Wales and as far afield as Hereford and Shropshire. This historic town boasts a number of interesting buildings in addition to Owain Glyndwr's Parliament building. Royal House which stands on the main through road is a great example of a medieval house. 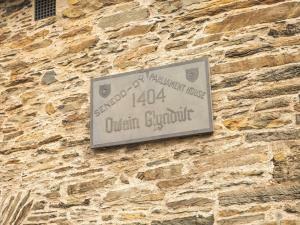 It is believed that a rogue by the name of Dafydd Gam was imprisoned at Royal House between 1404 and 1412 for attempting to assassinate Owain Glyndwr. Following his release, historic annals show that Dafydd went on to fight alongside Henry V at the Battle of Agincourt and, indeed, he is named amongst the dead in Shakespeare's Henry V.
Another tradition associated with Royal House is that Charles I stayed there in 1643 - and hence the name 'Royal House'. On 29 November 1644, near Dyfi Bridge, a battle took place between Oliver Cromwell's army under the command of Sir Thomas Myddleton of Chirk Castle and the Royalists. Many were killed and a number of houses in Machynlleth that were occupied by Royalists were burned down. In the 19th century, the daughter of a prominent local landowner married Viscount Seaham, the second son of the third Marquess of Londonderry and they made their home in Plas Machynlleth. On the death of his father, Viscount Seaham became Earl Vane. The grand clock tower which stands in the centre of Machynlleth on the site of the old Town Hall was erected by the townspeople to celebrate the coming of age of Charles Stewart Vane-Tempest, Viscount Castlereagh, the eldest son of Earl Vane and his wife. The foundation stone was laid on 15 July 1874. Another of their sons, Lord Herbert Vane-Tempest was the last member of the family to live at the Plas. He was killed in the Abermule train collision on the Cambrian Railways, and after his death, Plas Machynlleth was firstly used as a military facility during the Second World war then given to the townspeople. The historic town of Machynlleth sits at the mouth of the Dyfi estuary in the heart of the UNESCO Dyfi Bioshere, an area of outstanding natural beauty and diversity. In order to celebrate and protect this unique environment it has recently been made one of only two UNESCO Biosphere Reserve sites in the UK. The Centre for Alternative Technology has been hugely proactive in promoting ecological technology and lobbying for environmental policy both in the UK and internationally. The centre itself is extremely popular amongst visitors both as an inspiring educational resource and as a fun day out. Despite Machynlleth's rich political history and contemporary ecological and alternative subculture, it has also played an important role in the history of rock and roll. Led Zeppelin's Robert Plant has owned property here since he was a boy and penned the iconic 'Stairway to Heaven' as well as many more songs in Bron-Yr-Aur cottage just outside Machynlleth.